Good morning, and happy Saturday to you! Woohoo!! The weekend is here with all the promise of fun, relaxation, and a break from the stresses and worries of all that plagues us during the rest of the week. There is so much bad stuff going on right now in our world, and it's hard to get away from it. I know that we all are dealing with our own personal battles and worries, and it gets more and more difficult to cope with it all. It's days like that when you wake up, and find that some sneeky little elf has planted an adorable Lady Bug in your midst with the message attached you make my heart smile. Oh, boy! Couldn't we all use some extra smiles right about now?!! This adorable and timely award came from dear, sweet Kelly The Sandcastle Stamper, and I tell ya! Kelly has impeccable timing!! I'm proudly posting this award, because it does make my heart smile to know that she cares enough about me to stop in and check my blog on a regular basis, leave heartfelt comments, an endless notes of praise and encouragement. Thank you, Kelly for always being a bright spot in so many of our days, and consider this post my tribute to your faithful friendship and love. You are a gift from God, and I'm so happy and grateful that our paths have crossed, and I look forward to sharing a timeless friendship with you! I love ya, sweetie!! Now...on to sharing this award. I know many of you will receive this award, not once, but twice, and maybe many more times. Since it is a Top 10 Fav's!, I am compelled to share it with the blogs that I truly do visit as my favorites on a daily basis. The ones I ALWAYS stop by every day. So here goes. I'm sending this on to: Kadie; Sandra; Mary; Michelle; Karen; Lauri; Catherine; Carolyn; Jeanette; and Susan. 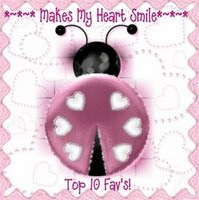 Of course, Kelly, you know that this comes back to you as well, because you know you are in my top 10+ too!! Friends, please feel free to post this award to your blog, because you are my favorites. And feel free to share on your blog if you'd like. If I get it back from some of you, I'm cool with that, and I'll just add your name to the list with Kelly. Thanks for stopping by today. I have a lot of projects in the works, but nothing completed yet. Stay tuned, there'll be some more cards coming soon! Have a blessed weekend!! OH, and I have to shout out to my sweet and wonderful friend Kadie who has been chosen to be one of the Gardners on The Greeting Farm Design Team! WOOHOO Kadie! You are awesome, and we knew it was only a matter of time! I Can't wait to see what her spring garden produces! Lorie, thank you so much for your kind words and ALL your encouragement. You and the other girls have blessed and inspired me SO much!